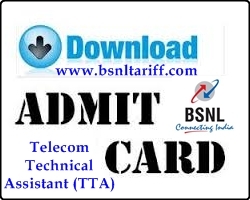 Public Sector Unit Bharat Sanchar Nigam Limited (BSNL) has provisioned to Download Admit cards for Telecom Technical Assistant (TTAs) invited online applications from the eligible candidates for recruitment Vacancies available in Bihar Telecom Circle in the IDA pay scale of Rs.13,600-25,420 plus allowance per month through open competitive examination. TTA is a SSA/Telecom District level cadre and examination will be conducted SSA/Telecom District wise on the same day. One applicat is allowed to appear in the examination against vacancy of one SSA/Telecom District only.